What are Garden Hot Tubs? Posted on January 22, 2019 , in Hot Tubs. You may have the term garden hot tub but are unfamiliar with what it means. 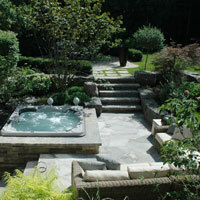 Simply put, garden hot tubs are outdoor, self-contained portable spas. These can be placed anywhere in your backyard, as long as the surface is both flat and supportive. However, lots of people choose to put their hot tub amid a beautiful garden. This is where the name garden hot tub comes from. If you are looking to transform your backyard into the ultimate oasis, a garden hot tub is a great way to go. Nothing can bring you such relaxation like surrounding yourself in pretty foliage, fresh air, and a warm bubble bath. These garden hot tubs can range from simplistic to luxuriously elaborate. Tuck your hot tub into the corner of your garden with a few shrubs for some privacy or make it the centerpiece. Surround your tubs with beautiful flowers, tall plants, and stylish accents to really make a statement. If you like the idea of adding a hot tub to your garden, but are not sure where to start, here are some factors you may want to consider. Maybe you already have a garden and the perfect spot picked out for your hot tub. If there is a flat space available where you can pour a pad of concrete, you will have the ideal place for your hot tub! If you have a garden, but not sure about whether the right spot is naturally available, you may need to clear out an area and have it leveled. As you are considering possible locations, know you will need an electrical hookup nearby as well as a water supply. If your preferred spot is in a fairly remote area of your garden, a contractor can help you extend wiring. When it comes to a water supply, in most cases all you need is a garden hose long enough to reach your hot tub. If you are hoping to build a structure around your hot tub, a gazebo, for example, make sure it is acceptable under your municipality laws. Some require permits or permission to build such a structure. Location can be a fairly easy factor to consider, but how you get to your hot tub can be more of a challenge. Hot tubs are more likely to be used when they are closer to the home. This makes it easier for bathers to hop in when it is cold or when they want to run in for a drink. One thing you definitely need to make sure is established, is a clear pathway to the hot tub. You will find plenty of options, even some that can enhance the appearance of the space. Even basic options can provide aesthetic appeal with a proper pathway. Grass may not be the best option because it can create a few problems. For example, grass can become slippery when too wet. Potentially leading bathers to slip and fall. It is also more likely that bathers will track in grass, dirt, and other debris into your hot tub. This will not just make your hot tub dirty, but too much can wear on the equipment. No matter if you have found the perfect spot near or far from your home, the most essential part is making sure your hot tub has enough space around the tub. You need enough space to make sure that bathers can move around the tub. You also need to make sure that repairs and maintenance can be performed near the cabinet and other parts of the hot tub. Consider where you will be placing your hot tub cover when it is not in use. Will you be able to easily move it on and off the tub? Having too much space likely is not a problem but too small space can create some undesirable situations. For example, will guests be able to relax near the hot tub or be able to store towels or drinks? Is the space too small to be enjoyed? Create the ideal outdoor oasis to make sure you maximize your hot tub experience. You now are aware of everything that needs to be considered when planning for your garden hot tub, continue to learn more about possible features by downloading a hot tub buyer’s guide.